Ever since Too Fat Lardies released their Blitzkrieg 1940 Handbook for Chain of Command I’ve been working mostly on Early War projects. 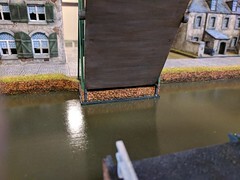 I had wanted to do something with this Sarissa canal bridge and after seeing how the owner of my FLGS built his canal for a Battle of Mons game I decided to adopt some of his techniques and build my own. 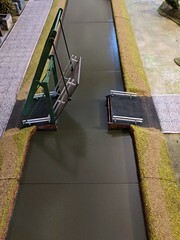 I don’t have the inclination, nor the room, to make dedicated terrain boards so like everything else the canal was going to have to be modular and easy to store. As my gaming mats are 60″ wide I decided to make 5 sections, each 12″ x 12″. I used panels of Ampersand hardboard and airbrushed several colors of green for the water and then applied three coats of Minwax acrylic gloss varnish using a foam brush. For the canal walls I used Pine Ranch Casing that I picked up at Lowes. This was cut into 12″ lengths (except for the bridge section) and airbrushed with some brown. For the walls I used some brick texture paper that was given to me by a friend. It was cut into strips and affixed with carpenter’s glue. This was finished off with a wash of Vallejo Sepia and some Secret Weapon Algae where it met the water. The completed walls were then glued to the panels with carpenter’s glue. Next I assembled the bridge and added some fine sand on the surface of the ramps. This was then primed and painted, and I added more brick paper on the horizontal surfaces. Before cutting the canal wall pieces I placed and marked out where the bridge would go. Then I cut the short pieces of casing and finished them the same way as the others. I didn’t get any pictures of it, but the bottom “base” of the bridge had a connecting piece to make it a one piece affair and help align the ramps when opening and closing it. I had taken a leap of faith and removed it while finishing the bridge, hoping that I could align the pieces well enough when I affixed them. I attached the bridge to the canal board using carpenter’s glue and set it aside to dry. Spoiler alert – it worked. To finish off the bridge piece, I fashioned some connecting wall pieces using card stock and the ever versatile brick paper. These were affixed to the board, and then the remaining space was filled with air-dry clay. Once this has set, I added more fine sand and painted it to kinda-sorta blend it in with the ramps. Then I flocked the edges making foot paths on both sides. I may add some detail parts in the future, and I do have some boats to finish, but for now it’s functional. Back in 2013 I reviewed a 28mm Crescent Root Studios warehouse. It’s a great piece, but it hasn’t been in heavy rotation in my games. I think the driving factor was it didn’t have a purpose. It was just this big set of buildings without a theme in the context of my other terrain. Thanks to Richard of Too Fat Lardies I found inspiration to resurrect the warehouse and turn it into something I will use more often. A few years ago Richard started posting a series on his blog about building a brewery. This, combined with the release of the 1940 Handbook for Chain of Command and an idea I had for running a game at Cold Wars, made me think that converting my warehouse into a brewery may be a good idea. I could have just made a sign and strewn a few barrels about, but I wanted to take the opportunity to do a few minor upgrades otherwise I feared it would just sit around gathering dust again. I applied the same techniques to all the buildings, and have used the outbuilding/shed as an example. I started by touching up the building walls by painting over some obvious tabs and then giving them a wash of Vallejo Sepia to bring out some detail. I then turned my attention to the doors. I painted the hinges and pulls, gave them a wash and then some dry brushing. Lastly, I focused on the roofs. The detail on these was a little soft, and they had tabs that were showing through so I decided to reshingle them. I purchased some self adhesive laser cut paper S-Scale shingles from Rail Scale Models. These were placed directly on the existing roof pieces. I then gave them a wash and dry brushed them with multiple colors. Once the buildings were done, I decided to copy Richard’s work a bit and add a smoke stack. I bought an HO stack from Walthers and covered it – somewhat poorly – with some textured brick paper a friend had given me. It was then given a wash and some light dry brushing. I then added an O-Scale ladder to cover up my awful vertical seams. It isn’t the best match for the other brickwork, but it’s good enough for me. Next I applied the same techniques I used on the buildings to the walls and platforms by touching up some exposed tabs and giving them a wash. I then made the decision to make a permanent base. In the past I thought that I may use the platforms and/or walls in other settings, but that never happened. I had a piece of tempered hardboard that was the right size, and to this I attached a piece of JTT grass matt to act as a moisture barrier and a base for the flocking. I layed out the walls and platforms, then once satisfied secured them with carpenter’s glue. After this had dried I applied the flock and tufts I wanted. To add some final detail I wanted to add an illuminated sign. I had a 3V gooseneck lamp in my electronic gadgets box, so I wired it up with a switch. I then printed out a sign, affixed it to a thin MDF base and overpainted it. I simply attached it with poster putty so if I want to change theaters or whatnot I can. Overall I’m pleased with the outcome and feel that this will get the playtime that it always deserved. I’m also happy that, apart from the large base, that it still breaks down for easy storage. As with anything of mine I imagine it will evolve over time. I have more barrels to add, and am already on the lookout for a hand cart. Lately I’ve been trying to finish up my WWII platoons that are in a partially finished state, so I started with some low hanging fruit by completing my Early War French. By “completed” I mean that I have no unpainted French left in the house. I’d like to add in some motorcycles now that they are available, but I digress. Here’s a photo dump.